Chow, R. and Johnson, T., Distributed Operating Systems & Algorithms, corrected 1st edition, AWL, 1998, ISBN: 0-201-49838-3. So far our discussion of failure and recovery has centered around checkpointing the state of the system. The next technique we will discuss is logging. Instead of preserving the state of the entire system at once, we will log, or record, each change to the state of the system. These changes are easy to identify -- we just log each message. In the event of a failure, we will play back this log and incrementally restore the system to its original state. The most intuitive technique for logging a system is synchronous logging. Synchronous logging requires that all messages are logged before they are passed to the application. In the event of a failure, recovery can be achieved by playing back all of the logs. Occasional checkpointing can allow the deletion of prior log entries. This approach does work, but it is tremendously expensive. 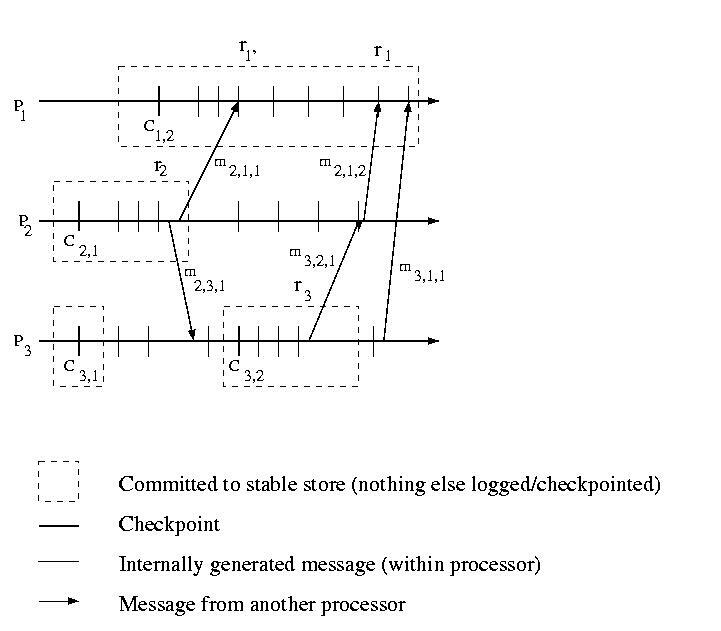 Messages cannot be passed to the application, until the messages are committed to a stable store. Stable storage is usually, much slower than RAM, &c. Sometimes performance can be improved by carefully managing the I/O device, e.x. using one disk for the log file to avoid seek delays, but it is still much slower than astable storage. In order to avoid the performance penalty associated with synchronous logging, we may choose to collect messages in RAM and to write them out occasionally as a batch, perhaps during idle times. If we take this approach, we have a similar management problem to that of uncoordinated checkpoints. Some messages may be logged, while others may not be logged. Our examples above assumed that messages would be logged by the receiver. Most of our discussion of logging will, in fact, be focused on receiver-based techniques. But, before we dive into these, let's take a quick look at logging messages at the sender. Sender based logging is very important in those cases where receivers are thin or unreliable. In other words, we would want to log messages on the sender if the receiver does not have the resources to maintain the logs, or if the receiver is likely to fail. This might be the case, for example, if the sender is a reliable server and the receiver a portable mobile device. So, let's assume that each sender logs each message it sends and that the receiver logs nothing. Recovery isn't quite so easy as having each sender play back its logs. Although each sender can play the messages back in the same order in which they were dispatched, there is no way to order the messages among the senders. The sender logs the message and dispatches it. The receiver receives the message and ACKs it with the current time (local to the receiver). If the above protocol is followed, the timestamp can be used to ensure that messages from multiple servers are processed by the receiver in the proper order. This is because all of the timestamps were assigned by the client, so clock skew is not a problem. (The timestamp can be as simple as a receive sequence number). But there is one small problem. Consider Sender sending a Message to Receiver. Now consider the same Sender sending a message, m', to Receiver. If the Receiver fails before it ACKS m, it is unknown whether or not m was received by the Receiver before the Sender dispatched m' -- we can't establish whether or not a causal relationship exists. One solution to this problem is to require that the sender send an ACK-ACK to the receiver. If the receiver blocks until it receives the ACK-ACK, the order of the messages will be clear. Given this protocol, recovery is very, very straight-forward. Upon reinitialization, the failed receiver sends a message to all other hosts in the system with the number of the last message that it remembers ACKing. The senders then replay their logs, including the receiver-assigned sequence numbers. The receiver applies these messages in the order of their sequence number. The senders know to ignore the responses to these messages. This process leads to a very simple, uncomplicated recovery. In order to recover from failure given asynchronous logging, we need some way for the processors to keep track of their current state, some way for them to communicate it to each other, and some way of evaluating the state of the system. The approach that we'll discuss makes use of direct dependency vectors. Before defining a DDV, we need to define an interval. 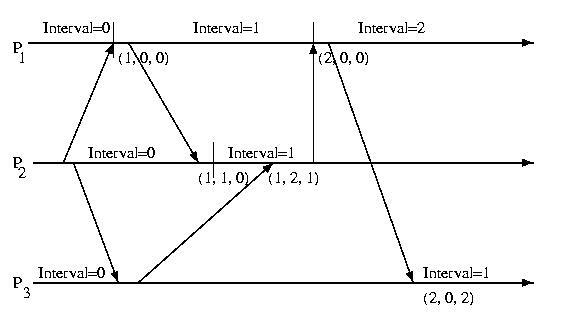 An interval on a processor is the period of time between receiving two messages. The intervals on a particular processor are sequentially numbered and given an interval index. Each time a processor sends a message, it also sends its current interval. On the receiving process, a direct dependency vector is associated with the event. This vector contains the processor's understanding of the interval on all processors. This information may be out of date, and does not take gossip into account. One processor is only informed about another processor's interval, if it directly receives a message from that processor. It is important to pay attention to the fact that the interval must be directly communicated from one process to another -- it is not transitive and cannot be communicated indirectly. A message from processor X to processor Y only contains X's interval, not the DDV present on X. The diagram below illustrates the intervals and DDVs associated with each processor. We can define the global state of the system at any point in time to be the collection of the DDVs at each processor. We can organize this state into a Global Dependency Matrix (GDM). We'll follow your textbook's nomenclature and give this the somewhat misleading label GDV. Notice that the first GDV is inconsistent. The DDV component of the GDV from Processor 1 indicates that Processor 1 has received a message from Processor 2 indicating that Processor 2 is in Interval 2. But the DDV vector within the GDV from Processor 2 indicates that Processor 2 is in Interval 1. This indicates an inconsistent recovery line. The second GDV does not have any inconsistencies -- it is consistent recovery line. We can check to see if a GDV is valid, by looking at each DDV one at a time. 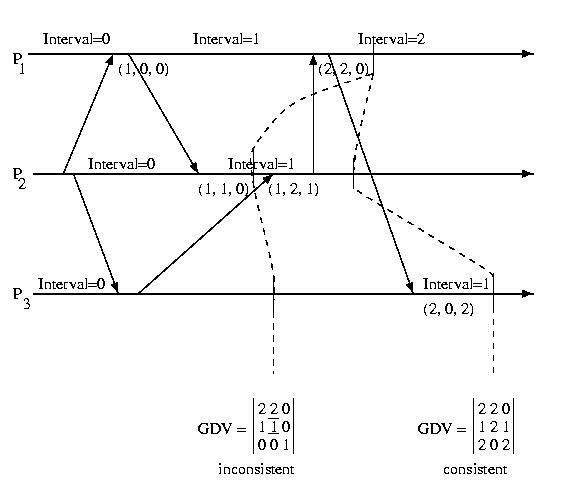 For each entry in a consistent DDV, the interval shown for another procesor must be less than or equal to the interval that that processor's DDV within the GDV contains for itself. In other words, no processor can have received a message from another processor originating in an interval in advance of that processor's current interval. So, we know what an inconsistent state looks like, but how do we find a recovery line? We start out with the initial state of all processors composing a valid recovery line. We store this in a vector, RV, that contains the interval index for each processor -- these will initially be 0. Then each time a processor commits enough log entries or checkpoints to make a new interval stable, it sends this information to a central server that tries to advance the recovery line. To find the recovery line, the coordinator keeps a matrix with the current recovery line, and a bin of recent interval updates that are are not a part of the current recovery line. The coordinator then applies the recent update to the matrix and checks for consistency. It also attempts to include as many of the other recent updates from the bin as possible. If it is unable to incorporate the most recent update into a consistent recovery lines, it adds it to the bin -- a future update may make it usable. // so make the candidate recovery line, the real thing. One might observe that it isn't necessary for a processor to log every message. It only needs to log those messages that have originated from processors that have taken checkpoints more recently than it has. If processors with less recent checkpoints were to fail, they would be forced to roll back prior to the message's sending, anyway. One approach for this problem is for each processor to give a sequence number to its checkpoints (as we have done before), and to keep a vector containing its best understanding of the most recent checkpoints on all other processors. If each time a message is sent, the current recovery line (CRL) is sent with it, a processor can determine if it is ahead of, or behind, the sender with respect to making checkpoints by comparing its checkpoint sequence number, to the sequence number of the sender in CRL received with the message. If the sender is ahead, the receiver will log the message. If not, it won't worry about it.